The Sun as climate driver is repeatedly discussed in the literature but proofs are often weak. In order to elucidate the solar influence, we have used a large number of temperature proxies worldwide to construct a global temperature mean G7 over the last 2000 years. The Fourier spectrum of G7 shows the strongest components as ~1000-, ~460-, and ~190 - year periods whereas other cycles of the individual proxies are considerably weaker. The G7 temperature extrema coincide with the Roman, medieval, and present optima as well as the well-known minimum of AD 1450 during the Little Ice Age. We have constructed by reverse Fourier transform a representation of G7 using only these three sine functions, which shows a remarkable Pearson correlation of 0.84 with the 31-year running average of G7. The three cycles are also found dominant in the production rates of the solar-induced cosmogenic nuclides 14C and 10Be, most strongly in the ~190 - year period being known as the De Vries/Suess cycle. By wavelet analysis, a new proof has been provided that at least the ~190-year climate cycle has a solar origin. Keywords: Worldwide temperature proxies, Solar-climate cycles, Solar origin of the ~190 year climate cycle with new accuracy. © 2017 Lüdecke and Weiss. Periodic or cyclic behaviour is so common in nature and physics that it gives the analysis technique of Fourier transform its outstanding importance. The reason for the abundance of cycles lies in the property of the transition from static to dynamic behaviour. This “modulational instability” occurs in space and time when the energy input into a dissipative system is increased beyond the range of static stability [1Zakharov VE, Ostrovsky LA. Modulation instability: The beginning. Physica D 2009; 238: 540-8. [http://dx.doi.org/10.1016/j.physd.2008.12.002] ]. It leads overwhelmingly to a periodic state (rare exceptions exist, e.g. the Lorenz model, where the onset of dynamics is chaotic). The Sun and the Earth are classic dissipative systems with energy input. Cyclic dynamics is therefore to be expected. Cycles with periods ranging from several years to more than 100,000 years [2Petit JR, Jouzel J, Raynaud D, et al. Climate and atmospheric history of the past 420,000 years from the Vostok ice core, Antarctica. Nature 1999; 399: 429-36. Data available at ftp://ftp.ncdc.noaa.gov/pub/data/paleo/icecore/antarctica/vostok/deutnat.txt 2017. Last access: April 2017] have accordingly been observed, e.g. in paleoclimate studies. The physical mechanism of climate cycles is mostly unknown and is not the main subject of this study. Autogeneous mechanisms and indirect solar forcing caused by the varying magnetic field of the Sun are discussed [3Mazzarella A. The 60-year solar modulation of global air temperature: The Earth’s rotation and atmospheric circulation connection. Theor Appl Climatol 2007; 88: 193-9. [http://dx.doi.org/10.1007/s00704-005-0219-z] , 4Mazzarella A. Solar Forcing of Changes in Atmospheric Circulation, Earth’s Rotation and Climate. Open Atmos Sci J 2008; 2: 181-4. [http://dx.doi.org/10.2174/1874282300802010181] , 5Mazzarella A. Sun-climate linkage now confirmed. Energy Environ 2009; 20(1): 123-30. [http://dx.doi.org/10.1260/095830509787689150] , 6Svensmark H, Bondo T, Svensmark J. Cosmic ray decreases affect atmospheric aerosols and clouds. Geophys Res Lett 2009; 36(15). [http://dx.doi.org/10.1029/2009GL038429] ]. Scafetta [7Scafetta N. Multi-scale harmonic model for solar and climate cyclical variation throughout the Holcene based on Jupiter-Saturn tidal frequencies plus the 11-year solar dynamo cycle. J Atmos Sol Terr Phys 2012; 80: 296-311. [http://dx.doi.org/10.1016/j.jastp.2012.02.016] ] provides evidence for the influence of planetary tides on the Sun, modulating the Sun's activity, cosmic ray flux and cloud formation by statistical correlation, and briefly discusses the assumed physical mechanism. Concerning statistical correlation, Bond et al. [8Bond G, Kromer B, Beer J, et al. Persistent solar influence on North Atlantic climate during the Holocene. Science 2001; 294(5549): 2130-6. [http://dx.doi.org/10.1126/science.1065680] [PMID: 11739949] ] found an apparently solar-related 1500 year cycle. Liu et al. [9Liu Y, Cai Q, Song H, An Z, Linderholm HW. Amplitudes, rates, periodicities and causes of temperature variations in the past 2485 years and future trends over the central-eastern Tibetan Plateau. Chin Sci Bull 2011; 56: 2986-94. [http://dx.doi.org/10.1007/s11434-011-4713-7] ] found cycles of 1324, 800, 199, 110 years from tree rings in the Tibetan plateau. Kern et al. [10Kern AK, Harzhauser M, Piller WE, Mandic O, Soliman A. Strong evidence for the influence of solar cycles on a Late Miocene lake system revealed by biotic and abiotic proxies. Palaeogeogr Palaeoclimatol Palaeoecol 2012; 329-330(5): 124-36. [http://dx.doi.org/10.1016/j.palaeo.2012.02.023] [PMID: 23564975] ] reported on a late Miocene lake system indicating periods of 80, 120, 208, 500, 1000, and 1500 years. Zhao and Feng [11Zhao XH, Feng XS. Correlation between solar activity and the local temperature of Antarctica during the past 11,000 years. J Atmos Sol Terr Phys 2014; 122: 26-33. [http://dx.doi.org/10.1016/j.jastp.2014.11.004] ] found periods of 208, 521, and ~1000 years from Antarctic ice cores. Knudsen et al. [12Knudsen MF, Riisager P, Jacobsen BH, Muscheler R, Snowball I, Seidenkrantz M-S. Taking the pulse of the Sun during the Holocene by joint analysis of 14C and 10Be. Geophys Res Lett 2009; 36(16). [http://dx.doi.org/10.1029/2009GL039439] , 13Knudsen MF, Jacobsen BH, Riisager P, Olsen J, Seidenkrantz M-S. Evidence of Suess solar-cycle bursts in subtropical Holocene speleothem δ18O records. Holocene 2011; 22: 597-602. [http://dx.doi.org/10.1177/0959683611427331] ] observed correlation of the ~200 year De Vries/Suess cycle in spectrograms of solar activity with that of temperature variations in caves of China, Turkey, and the USA. Steinhilber and Beer [14Steinhilber F, Beer J. Prediction of solar activity for the next 500 years. J Geophys Res-Space 2013; 118: 1861-7. [http://dx.doi.org/10.1002/jgra.50210] ] have investigated the solar activity of the last 10,000 years, finding strong indications of the De Vries/Suess cycle, and have predicted on these grounds a future temperature scenario. Babich et al. [15Babich VV, Darin AV, Kalugin IA, Snolyaninova LG. Climate prediction for the extratropical northern hemisphere for the next 500 years based on periodic natural processes. Russ Meteorol Hydrol 2016; 41(9): 593-600. [http://dx.doi.org/10.3103/S1068373916090016] ] have found periods of ~1000, ~500 to ~350, and ~200 years in paleoreconstruction of the last 2000 years, predicting a strongly pronounced cooling until AD 2500. In this context, we need to mention Schlesinger and Ramankutty [16Schlesinger ME, Ramankutty N. An oscillation in the global climate system of period 65-70 years. Nature 1994; 367: 723-6. [http://dx.doi.org/10.1038/367723a0] ], Gervais [17Gervais F. Anthropogenic CO2 warming challenged by 60-year cycle. Earth Sci Rev 2016; 155: 129-35. [http://dx.doi.org/10.1016/j.earscirev.2016.02.005] ], De Vries [18De Vries H. Variation in concentration of radiocarbon with time and location on Earth. Koninkl Ned Akad Wetenschappen Proc 1958; B61: 94-102. ], Suess [19Suess HE. The radiocarbon record in tree rings of the last 8000 years. Radiocarbon 1980; 22(2): 200-9. [http://dx.doi.org/10.1017/S0033822200009462] ], Steinhilber et al. [20Steinhilber F, Abreu JA, Beer J. Solar modulation during the Holozene. Astrophys Space Sci Trans 2008; 4: 1-6. [http://dx.doi.org/10.5194/astra-4-1-2008] , 21Steinhilber F, Abreu JA, Beer J, et al. 9,400 years of cosmic radiation and solar activity from ice cores and tree rings. P Natl Acad Sci USA 2012; 109: 5967-71. Data available at: ftp://ftp.ncdc.noaa.gov/pub/data/paleo/climate_forcing/solar_variability/steinhilber2012.txt (last access: April 2017). ], Breitenmoser et al. [22Breitenmoser P, Beer J, Brönnimann S, Frank D, Steinhilber F, Wanner H. Solar and volcanic fingerprints in tree-ring chronologies over the past 2000 years. Palaeogeogr Palaeoclimatol Palaeoecol 2012; 313-314: 127-39. [http://dx.doi.org/10.1016/j.palaeo.2011.10.014] ], Cliver et al. [23Cliver EW, Boriakoff V, Feynman J. Solar variability and climate change: Geomagnetic aa index and global surface temperature. Geophys Res Lett 1998; 25(7): 1035-8. [http://dx.doi.org/10.1029/98GL00499] ], Raspopov et al. [24Raspopov OM, Dergachev VR, Esper J, et al. The influence of the de Vries (~200-year) solar cycle on climate variations: Results from the Central Asian Mountains and their global link. Palaeogeogr Palaeoclimatol Palaeoecol 2008; 259: 6-16. [http://dx.doi.org/10.1016/j.palaeo.2006.12.017] ], Novello et al. [25Novello VF, Cruz FW, Karmann I, et al. Multidecadal climate variability in Brazil's Nordeste during the last 3000 years based on speleothem isotope records. Geophys Res Lett 2012; 39(23). [http://dx.doi.org/10.1029/2012GL053936] ], Wagner et al. [26Wagner G, Beer J, Masarik J, et al. Presence of the solar De Vries cycle (~205 years) during the last ice age. Geophys Res Lett 2001; 28(2): 303-6. [http://dx.doi.org/10.1029/2000GL006116] ], Lüdecke et al. [27Lüdecke H-J, Hempelmann A, Weiss CO. Multi-periodic climate dynamics: Spectral analysis of long-term instrumental and proxy temperature records. Clim Past 2013; 9: 447-52. [http://dx.doi.org/10.5194/cp-9-447-2013] , 28Lüdecke H-J, Hempelmann A, Weiss CO. Paleoclimate forcing by the solar de Vries / Suess cycle. Clim Past Discuss 2015; 11: 279-305. [http://dx.doi.org/10.5194/cpd-11-279-2015] ], Friis-Christensen and Lassen [29Friis-Christensen E, Lassen K. Length of the solar cycle: An indicator of solar activity closely associated with climate. Science 1991; 254(5032): 698-700. [http://dx.doi.org/10.1126/science.254.5032.698] [PMID: 17774798] ], Van Geel et al. [30Van Geel B, van der Plicht J, Renssen H. Major ∆14C excursions during the late glacial and early Holocene: Changes in ocean ventilation or solar forcing of climate change? Quat Int 2003; 105: 71-6. [http://dx.doi.org/10.1016/S1040-6182(02)00152-0] ], Braun et al. [31Braun H, Christl M, Rahmstorf S, et al. Possible solar origin of the 1,470-year glacial climate cycle demonstrated in a coupled model. Nature 2005; 438(7065): 208-11. [http://dx.doi.org/10.1038/nature04121] [PMID: 16281042] ], Lohmann and Schöne [32Lohmann G, Schöne BR. Climate signatures on decadal to interdecadal time scales as obtained from mollusk shells (Arctica islandica) from Iceland. Palaeogeogr Palaeoclimatol Palaeoecol 2013; 373: 152-62. [http://dx.doi.org/10.1016/j.palaeo.2012.08.006] ], Czymzik et al. [33Czymzik M, Muscheler R, Brauer A. Solar modulation of flood frequency in central Europe during spring and summer on interannual to multi-centennial timescales. Clim Past 2016; 12: 799-805. [http://dx.doi.org/10.5194/cp-12-799-2016] ], Adolphi et al. [34Adolphi F, Muscheler R, Svensson A, et al. 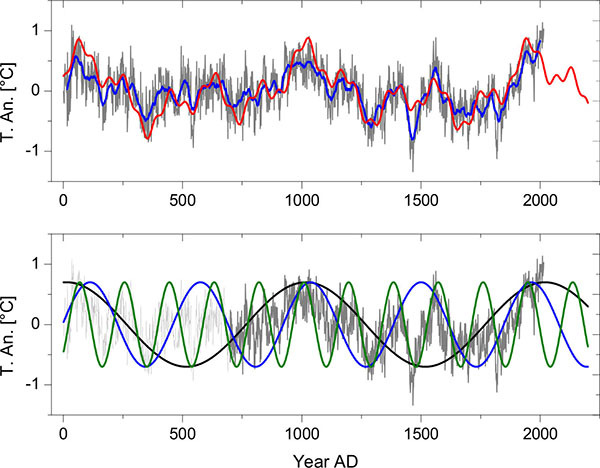 Persistent link between solar activity and Greenland climate during the Last Glacial Maximum. Nat Geosci 2014; 7: 662-6. [http://dx.doi.org/10.1038/ngeo2225] ], Wirth et al. [35Wirth SB, Glur L, Gilli A, Anselmetti FS. Holocene flood frequency across the Central Alps - solar forcing and evidence for variations in North Atlantic atmospheric circulation. Quat Sci Rev 2013; 80: 112-28. 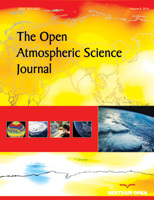 [http://dx.doi.org/10.1016/j.quascirev.2013.09.002] ], Lockwood [36Lockwood M. Solar influence on global and regional climates. Surv Geophys 2012; 33: 503-34. [http://dx.doi.org/10.1007/s10712-012-9181-3] ], Fleitmann et al. [37Fleitmann D, Burns SJ, Mudelsee M, et al. Holocene forcing of the Indian monsoon recorded in a stalagmite from southern Oman. Science 2003; 300(5626): 1737-9. [http://dx.doi.org/10.1126/science.1083130] [PMID: 12805545] ], Svensmark [38Svensmark H. Influence of cosmic rays on Earth’s climate. Phys Rev Lett 1998; 81(22): 5027-30. [http://dx.doi.org/10.1103/PhysRevLett.81.5027] ], Svensmark et al. [6Svensmark H, Bondo T, Svensmark J. Cosmic ray decreases affect atmospheric aerosols and clouds. Geophys Res Lett 2009; 36(15). [http://dx.doi.org/10.1029/2009GL038429] ], Marsh and Svensmark [39Marsh ND, Svensmark H. Low cloud properties influenced by cosmic rays. Phys Rev Lett 2000; 85(23): 5004-7. [http://dx.doi.org/10.1103/PhysRevLett.85.5004] [PMID: 11102172] ], Enghoff [40Enghoff MB, Pedersen JO, Uggerhoj UI, Paling SM. Aerosol nucleation induced by a high energy particle beam. Geophys Res Lett 2011; 38(9). [http://dx.doi.org/10.1029/2009RG000282] ], Haigh [42Haigh JD. The role of stratospheric ozone in modulating the solar radiative forcing of climate. Nature 1994; 370: 544-6. [http://dx.doi.org/10.1038/370544a0] , 43Haigh JD. The impact of solar variability on climate. Science 1996; 272(5264): 981-4. [http://dx.doi.org/10.1126/science.272.5264.981] [PMID: 8662582] ], Ineson et al. [44Ineson S, Scaife AA, Knight JR, et al. Solar forcing of winter climate variability in the Northern Hemisphere. Nat Geosci 2011; 4: 753-7. [http://dx.doi.org/10.1038/ngeo1282] ], Seidenglanz et al. [45Seidenglanz A, Prange M, Varma V, Schulz M. Ocean temperature response to idealized Gleissberg and de Vries solar cycles in a comprehensive climate model. Geophys Res Lett 2012; 39(22). [http://dx.doi.org/10.1029/2001GL014557] ], Meehl et al. [47Meehl GA, Washington WM, Wigley TM, Arblaster JM, Dai A. Solar and greenhouse gas forcing and climate response in the twentieth century. J Clim 2002; 16: 426-44. [http://dx.doi.org/10.1175/1520-0442(2003)016<0426:SAGGFA>2.0.CO;2] ], and Leal-Silva and Herrera [48Leal-Silva MC, Velasco Herrera VM. Solar forcing on the ice winter severity index in the western Baltic region. J Atmos Sol Terr Phys 2012; 89: 98-109. [http://dx.doi.org/10.1016/j.jastp.2012.08.010] ]. Lüning [49Lüning S. Compilation of references of solar-climate cycles available at www.klimaargumente.de/#sonne 2014 (last access: April 2017), and chrono.qub.ac.uk/blaauw/cds.html 2017. (last access: April).] provides an extensive compilation of pertinent references. All climate-cycle investigations mentioned relate to local climate. In contrast to these, in the present work, we have investigated dominant cycles in worldwide temperature proxy data of the last 2000 years complemented by instrumental temperature measurements of global temperatures provided by HADCRUT4 [50Climatic Research Unit, University of East Anglia. Data available at https://crudata.uea.ac.uk/cru/data/temperature/ 2017. (last access: April)], from AD 1850 onwards, and by RSS satellite data [51Remote Sensing System (USA). Data available at http://www.remss.com/measurements/upper-air-temperature 2017. (last access: April). ], from AD 1979 onwards. Records of the cosmic isotopes 14C and 10Be found in tree rings and ice cores confirm that the magnetic field of the Sun had varied over distinct cycles in the past [14Steinhilber F, Beer J. Prediction of solar activity for the next 500 years. J Geophys Res-Space 2013; 118: 1861-7. [http://dx.doi.org/10.1002/jgra.50210] , 21Steinhilber F, Abreu JA, Beer J, et al. 9,400 years of cosmic radiation and solar activity from ice cores and tree rings. P Natl Acad Sci USA 2012; 109: 5967-71. Data available at: ftp://ftp.ncdc.noaa.gov/pub/data/paleo/climate_forcing/solar_variability/steinhilber2012.txt (last access: April 2017).]. We have elucidated the solar origin of the most pronounced climate cycles of ~1000, ~460, and ~190 year periods in our data. In particular, by wavelet analysis, we have confirmed the solar origin of the most prominent ~190 year cycle over 10,000 years with new accuracy. We used paleotemperature reconstructions and instrumental temperature records for the construction of a global temperature record from AD 1 to AD 2015. For sufficient resolution of the Fourier analysis and to avoid possible distortions by interpolations, temperature reconstructions of 1-year time resolution are desirable. Unfortunately, these conditions are not generally given. As suitable records, we selected the instrumental global HADCRUT4 data [50Climatic Research Unit, University of East Anglia. Data available at https://crudata.uea.ac.uk/cru/data/temperature/ 2017. (last access: April)] from 1850 to 2015 AD, the global RSS satellite temperature data [51Remote Sensing System (USA). Data available at http://www.remss.com/measurements/upper-air-temperature 2017. (last access: April).] from 1979 to 2015 AD, and the following six paleotemperature reconstructions - their individual sites shown in Fig. (1 ). 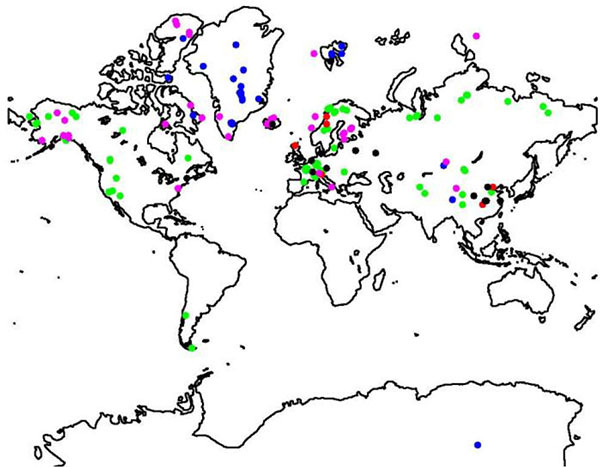 (Color online) Locations of the proxy-temperature records used. Green color indicates tree-rings, blue ice-cores, red speleothems, magenta sediments, and black others. (Chr) Christiansen and Ljungqvist [52Christiansen B, Ljungqvist FC. The extra-tropical Northern Hemisphere temperature in the last two millennia: reconstructions of low-frequency variability. Clim Past 2012; 8: 765-786. Data available at ftp://ftp.ncdc.noaa.gov/pub/data/paleo/contributions_by_author/ christiansen2012/christiansen2012.txt 2017. (last access: April). ]: stack of different temperature proxies [°C], extracted from 91 single records, ~30% of them covering the total period, 0 to 1973 AD, 1 year time resolution, northern hemisphere. (Bün) Büntgen et al. [53Büntgen U, Tegel W, Nicolussi K, et al. 2500 years of European climate variability and human susceptibility. Science 2011; 331: 578-582. Data available at ftp://ftp.ncdc.noaa.gov/pub/data/paleo/treering/reconstructions/europe/buentgen2011europe.txt. 2017. (last access: April)]: tree-rings, extracted from over thousand ring width series of central Europe, temperature anomaly [oC], -499 to 2003 BC/AD, 1 year time resolution. (McK) McKay and Kaufman [54McKay NP, Kaufmann DS. An extended Arctic proxy temperature database for the past 2,000 years. Sci Data 2014; 1(140026). Data available at http://ncdc.noaa.gov/paleo/study/16973 2017. (last access: April). ]: stack of different temperature proxies [°C], extracted from 59 single records, ~20% of them covering the whole period, 1 to 2000 AD, 1 year time resolution, Arctic 60o- 90o N.
(Vill-N) Villalba et al. [55Villalba R, Boninsegna JA, Masiokas M, et al. Large-Scale Temperature Changes Across the Southern Andes: 20th-Century Variations in the Context of the Past 400 Years. Climatic Change 2003; 59: 177-232. Data available at: ftp://ftp.ncdc.noaa.gov/pub/data/paleo/treering/ reconstructions/southamerica/patagonia-temperature.txt 2017. (last access: April). ]: tree-rings, temperature [°C], 1640 to 1987 AD, 1 year time resolution, Patagonia-North ~37o S and (Vill-S): tree-rings, temperature [°C], 1640 to 1993 AD, 1 year time resolution, Patagonia-South ~55o S.
(Pet) Petit et al. [2Petit JR, Jouzel J, Raynaud D, et al. Climate and atmospheric history of the past 420,000 years from the Vostok ice core, Antarctica. Nature 1999; 399: 429-36. Data available at ftp://ftp.ncdc.noaa.gov/pub/data/paleo/icecore/antarctica/vostok/deutnat.txt 2017. Last access: April 2017]: temperature anomaly [°C] from δD of ice-cores, -420,000 to ~1950 BC/AD, 17 to 50 years time resolution, Antarctica. All used records are temperature reconstructions. Thus no further data aggregation or formatting procedures were necessary. We constructed from the individual temperature reconstructions a global mean G7 as follows: Each reconstruction was normalized to an anomaly around the year 1950, thereby allowing for different mean temperatures at different latitudes. The satellite data beginning in 1979 were adjusted to the 1979 HADCRUT4 data. Years before AD 1 in the reconstructions were omitted. For Bün, HADCRUT4 and Pet respectively the most recent years which show unusual deviations from the remaining reconstructions were also omitted. Next, for every year from AD 1 to AD 2015 the mean of these reconstructions which covered this particular year yields the pertinent temperature of G7. After that, G7, covering AD 1 to 2015, was again adjusted to an anomaly around its mean. Table 1 gives an overview of the data. The left panels of Fig. (2 ) show all reconstructions and G7 for the times specified in column “RL” of Table (1) (HADCRUT4 and RSS are not shown). G7 in more detail is depicted in the upper panel of Fig. (3 ) in grey and its 31-year running mean in blue color. Data details. All records are proxy-temperatures [°C], except for Stei as the common production rate PC of the cosmogenic nuclides 14C and 10Be. BC/AD: length of the original record; RL: record length applied for constructing G7; Res. : Time resolution. For a comparison of global temperatures with the activity of the Sun, the cosmic-ray nuclides 14C and 10Be are an appropriate measure [56Stuiver M, Reimer PJ, Bard E, et al. INTCAL98 radiocarbon age calibration, 24,000-0 cal BP. Radiocarbon 1998; 40(3): 1041-83. [http://dx.doi.org/10.1017/S0033822200019123] , 57Bard E, Raisbeck GM, Yiou F, Jouzel J. Solar modulation of cosmogenic nuclide production over the last millennium: comparison between 14C and 10Be records. Earth Planet Sci Lett 1997; 150: 453-62. [http://dx.doi.org/10.1016/S0012-821X(97)00082-4] , 20Steinhilber F, Abreu JA, Beer J. Solar modulation during the Holozene. Astrophys Space Sci Trans 2008; 4: 1-6. [http://dx.doi.org/10.5194/astra-4-1-2008] , 58Muscheler R, Beer J, Kubic PW, Synal H-A. Geomagnetic field intensity during the last 60,000 years based on 10Be and 36Cl from the Summit ice cores and 14C. Quat Sci Rev 2005; 24: 1849-60. [http://dx.doi.org/10.1016/j.quascirev.2005.01.012] , 21Steinhilber F, Abreu JA, Beer J, et al. 9,400 years of cosmic radiation and solar activity from ice cores and tree rings. P Natl Acad Sci USA 2012; 109: 5967-71. Data available at: ftp://ftp.ncdc.noaa.gov/pub/data/paleo/climate_forcing/solar_variability/steinhilber2012.txt (last access: April 2017)., 14Steinhilber F, Beer J. Prediction of solar activity for the next 500 years. J Geophys Res-Space 2013; 118: 1861-7. [http://dx.doi.org/10.1002/jgra.50210] ]. We used a record of the common production rate of these nuclides that extends back to ~9500 years BP, here abbreviated as Stei [21Steinhilber F, Abreu JA, Beer J, et al. 9,400 years of cosmic radiation and solar activity from ice cores and tree rings. P Natl Acad Sci USA 2012; 109: 5967-71. Data available at: ftp://ftp.ncdc.noaa.gov/pub/data/paleo/climate_forcing/solar_variability/steinhilber2012.txt (last access: April 2017).] and evaluated from tree-rings and ice-cores. The characteristics of Stei are given in Table 1, its variation in time is shown in last row, column 2 of Fig. (2 ). For the discrete Fourier transformation, the individual reconstructions, converted to anomalies around the mean, were padded with 25,000 zeros to yield interpolation of the spectra. The false-alarm levels for the spectra were generated by Monte Carlo simulation, in each case with 10,000 random time series of identical length, anomaly around the mean, Hurst exponent and zero padding as the pertinent record. The Hurst exponents were obtained by detrended fluctuation analysis [59Kantelhardt JW, Koscielny-Bunde E, Rego HH, Havlin S, Bunde A. Detecting long-range correlations with detrended fluctuation analysis. Physica A 2001; 295: 441-54. [http://dx.doi.org/10.1016/S0378-4371(01)00144-3] ]. For the reconstructions Stei [21Steinhilber F, Abreu JA, Beer J, et al. 9,400 years of cosmic radiation and solar activity from ice cores and tree rings. P Natl Acad Sci USA 2012; 109: 5967-71. Data available at: ftp://ftp.ncdc.noaa.gov/pub/data/paleo/climate_forcing/solar_variability/steinhilber2012.txt (last access: April 2017).] and Pet [2Petit JR, Jouzel J, Raynaud D, et al. Climate and atmospheric history of the past 420,000 years from the Vostok ice core, Antarctica. Nature 1999; 399: 429-36. Data available at ftp://ftp.ncdc.noaa.gov/pub/data/paleo/icecore/antarctica/vostok/deutnat.txt 2017. Last access: April 2017], which are unevenly spaced and have time steps larger than 1 year, we first applied the method of Lomb [60Lomb NR. Least-squares frequency analysis of unequally spaced data. Astrophys Space Sci 1967; 39(2): 447-62. [http://dx.doi.org/10.1007/BF00648343] ] and Scargle [61Scargle JD. Studies in astronomical time series analysis. II - Statistical aspects of spectral analysis of unevenly spaced data. Astrophys J 1982; 263: 835-53. [http://dx.doi.org/10.1086/160554] ]. Since this method yields the same results as the Fourier analysis of the records interpolated to one year steps, the Fourier analyses and the following wavelet analyses were carried out with the interpolated records. The right panels of Fig. (2 ) show the results of the spectral analyses. For the longest records Pet [2Petit JR, Jouzel J, Raynaud D, et al. Climate and atmospheric history of the past 420,000 years from the Vostok ice core, Antarctica. Nature 1999; 399: 429-36. Data available at ftp://ftp.ncdc.noaa.gov/pub/data/paleo/icecore/antarctica/vostok/deutnat.txt 2017. Last access: April 2017] and Stei [21Steinhilber F, Abreu JA, Beer J, et al. 9,400 years of cosmic radiation and solar activity from ice cores and tree rings. P Natl Acad Sci USA 2012; 109: 5967-71. Data available at: ftp://ftp.ncdc.noaa.gov/pub/data/paleo/climate_forcing/solar_variability/steinhilber2012.txt (last access: April 2017).] wavelet analyses were applied and are shown in the two upper panels of Fig. (4 ). Wavelets give insight into the link of solar activity with Earth temperatures as described in the section “Sun's activity and climate”. (Color online) Left panels: Temperature records [oC] as anomalies around the mean, of Chr, Bün, McK, Vill-N, Vill-S, Pet, and the composite global record G7. The record of common production rate PC of the cosmogenic nuclides 14C and 10Be, Stei, is depicted in panel row 4, column 2. Right panels: Pertinent Fourier spectra with false-alarm lines of 95% (green) and 99% (red). The period of the strongest peak (generally ~190 year) is given. Table 2 gives the periods corresponding to the strongest peaks of the spectra shown on the right hand side of Fig. (2 ). 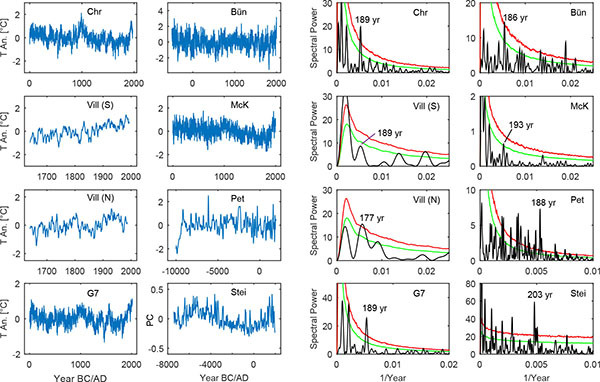 Strongest spectral peaks for the records Chr, Bün, McK, Vill-N, Vill-S, Pet, G7, and Stei for periods > 700 years, from 700 to 300 years, from 300 to 100 years, and < 100 years. There are substantial variations in the frequencies of obviously pertinent peaks in different records. Even for the same proxy (tree-rings) and sites apart by 2000 km, the ~190 - year period peaks of Vill-N and Vill-S differ by 12 years in period. Because we found no explanation for such differences in the literature we think that data noise is most likely the main cause of the deviations. As an attempt to test this assumption, we shortened the Bün record (total length 2503 years) in several steps to a minimum length of 1600 years. In the Fourier analyses of the shortened records we found values from 1250 to 1047 for the ~1000 - year period, from 608 to 408 for the ~460 - year period, and from 186 to 181 for the ~190 - year period. The averaging of a large number of data as used here can be expected to minimize the impact of such data inaccuracy. The spectrum of the composite global record G7 has - much more distinctly than the individual records, likely due to the averaging - the strongest peaks for the periods of 1003, 463, and 188 years. In particular, in the low frequency region practically no other peaks are visible. For the inverse Fourier transformation we used the mentioned longest three periods to obtain a representation of G7 with only three sine functions. These three cycles are already known from previous studies as cited in the section “Introduction/Overview”. This insures that the selected cycles are not artifacts of the Fourier transformation. The upper panel of Fig. (3 ) shows the original G7 (grey), the 31-year running mean of G7 (blue) corresponding to the definition of “climate”, and the sine representation of G7 (green). Tentatively, we also constructed the representation with four sines including the ~60-year period (red). (Color online) Upper panel: Global record G7 (grey), running 31-year average of G7 (blue), sine representation of G7 with three sine functions of the periods 1003, 463, and 188 years (green), with four sine functions including the period ~60 years (red), continued to AD 2200. The parameters of the sine functions are given in Table 3. The Pearson correlation between the 31 year running average of G7 and the three-sine representation (green) is 0.84, for the four-sine representation (red) 0.85. Lower panel: G7 (grey) together with the sine functions of 1003, 463, and 188 - year periods continued until AD 2200 (equal sine amplitudes for clarity). The Pearson correlation of G7 and the three-sine representation is 0.65, while that with the 31-year running mean of G7 is remarkable 0.84. A four-sine representation which includes the ~60-year cycle improves this correlation only to 0.85. The ~60-year cycle is, however, important for shorter time studies. e.g. Gervais [17Gervais F. Anthropogenic CO2 warming challenged by 60-year cycle. Earth Sci Rev 2016; 155: 129-35. [http://dx.doi.org/10.1016/j.earscirev.2016.02.005] ] shows that the ~60-year cycle explains the temperature plateau observed since the end of the 20th century. The sine representation is continued in Fig. (3 ) until AD 2200 for future climate trends. It shows a drop from the present maximum to AD ~2050, a slight rise until AD ~2130 and a second drop to AD 2200. Babich et al. [15Babich VV, Darin AV, Kalugin IA, Snolyaninova LG. Climate prediction for the extratropical northern hemisphere for the next 500 years based on periodic natural processes. Russ Meteorol Hydrol 2016; 41(9): 593-600. [http://dx.doi.org/10.3103/S1068373916090016] ] come to similar conclusions. The lower panel of Fig. (3 ) shows G7 (grey) together with the three sines of 1003, 463, and 188 - year periods of the representation (sine of ~60 years not shown). We emphasize that all three sines have maxima near AD 0, 1000, and 2000. (Table 3) cites the parameters of the sine representation. Representation of G7 by sine functions S = A∙sin (2πf∙(yr - 1)+φ) , f - frequency, p - period, A - amplitude (amplitudes multiplied with a common arbitrary factor for clarity of Fig. 3 , φ- phase in radians. Table (2) demonstrates that Stei [21Steinhilber F, Abreu JA, Beer J, et al. 9,400 years of cosmic radiation and solar activity from ice cores and tree rings. P Natl Acad Sci USA 2012; 109: 5967-71. Data available at: ftp://ftp.ncdc.noaa.gov/pub/data/paleo/climate_forcing/solar_variability/steinhilber2012.txt (last access: April 2017).] as the record mirroring the Sun's activity shows the same periods of ~1000, ~500, and ~200 years as found for the temperature record G7, suggesting the Sun as the main climate driver. This hypothesis is often emphasized in the literature (see references under “Introduction/Overview”). However, comparable periods alone would not to be sufficient for excluding autogenous climate mechanisms. To get more insight on a solar link with climate cycles we compared by wavelet analysis the temperatures of Pet [2Petit JR, Jouzel J, Raynaud D, et al. Climate and atmospheric history of the past 420,000 years from the Vostok ice core, Antarctica. Nature 1999; 399: 429-36. Data available at ftp://ftp.ncdc.noaa.gov/pub/data/paleo/icecore/antarctica/vostok/deutnat.txt 2017. Last access: April 2017] with the production rate of the cosmogenic nuclides 14C and 10Be of Stei [21Steinhilber F, Abreu JA, Beer J, et al. 9,400 years of cosmic radiation and solar activity from ice cores and tree rings. P Natl Acad Sci USA 2012; 109: 5967-71. Data available at: ftp://ftp.ncdc.noaa.gov/pub/data/paleo/climate_forcing/solar_variability/steinhilber2012.txt (last access: April 2017).] over 9000 years (see Table 1. and Fig. 2 ). The upper and middle panel of Fig. (4 ) show already by eyesight similarities in the power of the ~190 - year period over 9000 years, thus confirming earlier findings of Knudsen et al. [13Knudsen MF, Jacobsen BH, Riisager P, Olsen J, Seidenkrantz M-S. Evidence of Suess solar-cycle bursts in subtropical Holocene speleothem δ18O records. Holocene 2011; 22: 597-602. (Color online) Upper panel: Wavelet spectrum of Antarctic temperatures Pet [2Petit JR, Jouzel J, Raynaud D, et al. Climate and atmospheric history of the past 420,000 years from the Vostok ice core, Antarctica. Nature 1999; 399: 429-36. Data available at ftp://ftp.ncdc.noaa.gov/pub/data/paleo/icecore/antarctica/vostok/deutnat.txt 2017. Last access: April 2017]. Middle panel: Wavelet spectrum of solar activity Stei [21Steinhilber F, Abreu JA, Beer J, et al. 9,400 years of cosmic radiation and solar activity from ice cores and tree rings. P Natl Acad Sci USA 2012; 109: 5967-71. Data available at: ftp://ftp.ncdc.noaa.gov/pub/data/paleo/climate_forcing/solar_variability/steinhilber2012.txt (last access: April 2017).]. Below the cone of influence, wavelet results are not significant. Lower panel: Spectral power for the period of ~190 years taken from the two wavelet spectra, powers in arbitrary units. Next, we extracted from the wavelet spectra the power of the frequency component of the ~190 - year period both for Pet [2Petit JR, Jouzel J, Raynaud D, et al. Climate and atmospheric history of the past 420,000 years from the Vostok ice core, Antarctica. Nature 1999; 399: 429-36. Data available at ftp://ftp.ncdc.noaa.gov/pub/data/paleo/icecore/antarctica/vostok/deutnat.txt 2017. Last access: April 2017] and Stei [21Steinhilber F, Abreu JA, Beer J, et al. 9,400 years of cosmic radiation and solar activity from ice cores and tree rings. P Natl Acad Sci USA 2012; 109: 5967-71. Data available at: ftp://ftp.ncdc.noaa.gov/pub/data/paleo/climate_forcing/solar_variability/steinhilber2012.txt (last access: April 2017).]. Fig. (4 ) shows these power curves in the lower panel. There is good agreement from -7000 until -5000 BC and from -1000 BC until present. In between these times similarities still exist. This signature would seem strong enough to confirm the Sun as the main driver of at least the ~190 - year climate cycle. For the periods of ~1000 and ~460 years we could not find a similar power agreement between Stei and Pet. The Fourier spectrum of a global temperature record G7, composed of high quality temperature proxies worldwide and recent instrumental data demonstrate the dominance of three climate cycles with ~1000 (Eddy cycle), ~460 (not named but frequently reported), and ~190 year periods (De Vries/Suess cycle). These three sines represent the 31-year running mean of G7 with the remarkable Pearson correlation of 0.84 indicating their importance for climate. G7, and likewise the sine representations have maxima of comparable size at AD 0, 1000, and 2000. We note that the temperature increase of the late 19th and 20th century is represented by the harmonic temperature representation, and thus is of pure multiperiodic nature. It can be expected that the periodicity of G7, lasting 2000 years so far, will persist also for the foreseeable future. It predicts a temperature drop from present to AD 2050, a slight rise from 2050 to 2130, and a further drop from AD 2130 to 2200 (see Fig. 3 ), upper panel, green and red curves). As a main result of our study, the construction of a global record G7 from numerous temperature proxies reduces noise and thus allows the isolation of these global cycles. The dominance of the significant frequency components in the G7 spectrum, as opposed to the strength of other components in the spectra of the individual proxy records supports this view. We provide a new confirmation for the link between solar activity and climate cycles by wavelet analysis showing a remarkably good agreement of the power of the ~190 - year period for temperatures and solar activity over 9000 years (see Fig. 4 lower panel). As (Fig. 2 and Table 2) show, the periods of ~1000 and ~460 years are also apparently common in records of temperatures and cosmogenic nuclides. We express our thanks to the referees for valuable comments. Zakharov VE, Ostrovsky LA. Modulation instability: The beginning. Physica D 2009; 238: 540-8. Mazzarella A. The 60-year solar modulation of global air temperature: The Earth’s rotation and atmospheric circulation connection. Theor Appl Climatol 2007; 88: 193-9. Mazzarella A. Solar Forcing of Changes in Atmospheric Circulation, Earth’s Rotation and Climate. Open Atmos Sci J 2008; 2: 181-4. Mazzarella A. Sun-climate linkage now confirmed. Energy Environ 2009; 20(1): 123-30. Svensmark H, Bondo T, Svensmark J. Cosmic ray decreases affect atmospheric aerosols and clouds. Geophys Res Lett 2009; 36(15). Scafetta N. Multi-scale harmonic model for solar and climate cyclical variation throughout the Holcene based on Jupiter-Saturn tidal frequencies plus the 11-year solar dynamo cycle. J Atmos Sol Terr Phys 2012; 80: 296-311. Bond G, Kromer B, Beer J, et al. Persistent solar influence on North Atlantic climate during the Holocene. Science 2001; 294(5549): 2130-6. Liu Y, Cai Q, Song H, An Z, Linderholm HW. Amplitudes, rates, periodicities and causes of temperature variations in the past 2485 years and future trends over the central-eastern Tibetan Plateau. Chin Sci Bull 2011; 56: 2986-94. Kern AK, Harzhauser M, Piller WE, Mandic O, Soliman A. Strong evidence for the influence of solar cycles on a Late Miocene lake system revealed by biotic and abiotic proxies. Palaeogeogr Palaeoclimatol Palaeoecol 2012; 329-330(5): 124-36. Zhao XH, Feng XS. Correlation between solar activity and the local temperature of Antarctica during the past 11,000 years. J Atmos Sol Terr Phys 2014; 122: 26-33. Knudsen MF, Riisager P, Jacobsen BH, Muscheler R, Snowball I, Seidenkrantz M-S. Taking the pulse of the Sun during the Holocene by joint analysis of 14C and 10Be. Geophys Res Lett 2009; 36(16). Knudsen MF, Jacobsen BH, Riisager P, Olsen J, Seidenkrantz M-S. Evidence of Suess solar-cycle bursts in subtropical Holocene speleothem δ18O records. Holocene 2011; 22: 597-602. Steinhilber F, Beer J. Prediction of solar activity for the next 500 years. J Geophys Res-Space 2013; 118: 1861-7. Babich VV, Darin AV, Kalugin IA, Snolyaninova LG. Climate prediction for the extratropical northern hemisphere for the next 500 years based on periodic natural processes. Russ Meteorol Hydrol 2016; 41(9): 593-600. Schlesinger ME, Ramankutty N. An oscillation in the global climate system of period 65-70 years. Nature 1994; 367: 723-6. Gervais F. Anthropogenic CO2 warming challenged by 60-year cycle. Earth Sci Rev 2016; 155: 129-35. De Vries H. Variation in concentration of radiocarbon with time and location on Earth. Koninkl Ned Akad Wetenschappen Proc 1958; B61: 94-102. Suess HE. The radiocarbon record in tree rings of the last 8000 years. Radiocarbon 1980; 22(2): 200-9. Steinhilber F, Abreu JA, Beer J. Solar modulation during the Holozene. Astrophys Space Sci Trans 2008; 4: 1-6. Steinhilber F, Abreu JA, Beer J, et al. 9,400 years of cosmic radiation and solar activity from ice cores and tree rings. P Natl Acad Sci USA 2012; 109: 5967-71. Data available at: ftp://ftp.ncdc.noaa.gov/pub/data/paleo/climate_forcing/solar_variability/steinhilber2012.txt (last access: April 2017). Breitenmoser P, Beer J, Brönnimann S, Frank D, Steinhilber F, Wanner H. Solar and volcanic fingerprints in tree-ring chronologies over the past 2000 years. Palaeogeogr Palaeoclimatol Palaeoecol 2012; 313-314: 127-39. Cliver EW, Boriakoff V, Feynman J. Solar variability and climate change: Geomagnetic aa index and global surface temperature. Geophys Res Lett 1998; 25(7): 1035-8. Raspopov OM, Dergachev VR, Esper J, et al. The influence of the de Vries (~200-year) solar cycle on climate variations: Results from the Central Asian Mountains and their global link. Palaeogeogr Palaeoclimatol Palaeoecol 2008; 259: 6-16. Novello VF, Cruz FW, Karmann I, et al. Multidecadal climate variability in Brazil's Nordeste during the last 3000 years based on speleothem isotope records. Geophys Res Lett 2012; 39(23). Wagner G, Beer J, Masarik J, et al. Presence of the solar De Vries cycle (~205 years) during the last ice age. Geophys Res Lett 2001; 28(2): 303-6. Lüdecke H-J, Hempelmann A, Weiss CO. Multi-periodic climate dynamics: Spectral analysis of long-term instrumental and proxy temperature records. Clim Past 2013; 9: 447-52. Lüdecke H-J, Hempelmann A, Weiss CO. Paleoclimate forcing by the solar de Vries / Suess cycle. Clim Past Discuss 2015; 11: 279-305. Friis-Christensen E, Lassen K. Length of the solar cycle: An indicator of solar activity closely associated with climate. Science 1991; 254(5032): 698-700. Van Geel B, van der Plicht J, Renssen H. Major ∆14C excursions during the late glacial and early Holocene: Changes in ocean ventilation or solar forcing of climate change? Quat Int 2003; 105: 71-6. Braun H, Christl M, Rahmstorf S, et al. 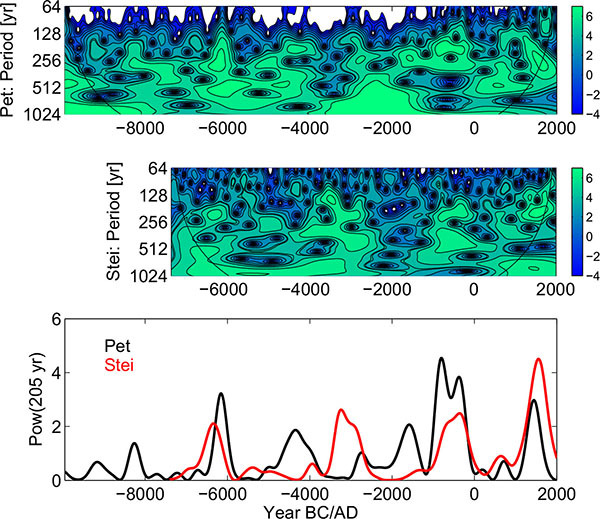 Possible solar origin of the 1,470-year glacial climate cycle demonstrated in a coupled model. Nature 2005; 438(7065): 208-11. Lohmann G, Schöne BR. Climate signatures on decadal to interdecadal time scales as obtained from mollusk shells (Arctica islandica) from Iceland. Palaeogeogr Palaeoclimatol Palaeoecol 2013; 373: 152-62. Czymzik M, Muscheler R, Brauer A. Solar modulation of flood frequency in central Europe during spring and summer on interannual to multi-centennial timescales. Clim Past 2016; 12: 799-805. Adolphi F, Muscheler R, Svensson A, et al. Persistent link between solar activity and Greenland climate during the Last Glacial Maximum. Nat Geosci 2014; 7: 662-6. Wirth SB, Glur L, Gilli A, Anselmetti FS. Holocene flood frequency across the Central Alps - solar forcing and evidence for variations in North Atlantic atmospheric circulation. Quat Sci Rev 2013; 80: 112-28. Lockwood M. Solar influence on global and regional climates. Surv Geophys 2012; 33: 503-34. Fleitmann D, Burns SJ, Mudelsee M, et al. Holocene forcing of the Indian monsoon recorded in a stalagmite from southern Oman. Science 2003; 300(5626): 1737-9. Svensmark H. Influence of cosmic rays on Earth’s climate. Phys Rev Lett 1998; 81(22): 5027-30. Marsh ND, Svensmark H. Low cloud properties influenced by cosmic rays. Phys Rev Lett 2000; 85(23): 5004-7. Enghoff MB, Pedersen JO, Uggerhoj UI, Paling SM. Aerosol nucleation induced by a high energy particle beam. Geophys Res Lett 2011; 38(9). Haigh JD. The role of stratospheric ozone in modulating the solar radiative forcing of climate. Nature 1994; 370: 544-6. Haigh JD. The impact of solar variability on climate. Science 1996; 272(5264): 981-4. Ineson S, Scaife AA, Knight JR, et al. Solar forcing of winter climate variability in the Northern Hemisphere. Nat Geosci 2011; 4: 753-7. Seidenglanz A, Prange M, Varma V, Schulz M. Ocean temperature response to idealized Gleissberg and de Vries solar cycles in a comprehensive climate model. Geophys Res Lett 2012; 39(22). Meehl GA, Washington WM, Wigley TM, Arblaster JM, Dai A. Solar and greenhouse gas forcing and climate response in the twentieth century. J Clim 2002; 16: 426-44. Leal-Silva MC, Velasco Herrera VM. Solar forcing on the ice winter severity index in the western Baltic region. J Atmos Sol Terr Phys 2012; 89: 98-109. Lüning S. Compilation of references of solar-climate cycles available at www.klimaargumente.de/#sonne 2014 (last access: April 2017), and chrono.qub.ac.uk/blaauw/cds.html 2017. (last access: April). Remote Sensing System (USA). Data available at http://www.remss.com/measurements/upper-air-temperature 2017. (last access: April). Christiansen B, Ljungqvist FC. The extra-tropical Northern Hemisphere temperature in the last two millennia: reconstructions of low-frequency variability. Clim Past 2012; 8: 765-786. Data available at ftp://ftp.ncdc.noaa.gov/pub/data/paleo/contributions_by_author/ christiansen2012/christiansen2012.txt 2017. (last access: April). McKay NP, Kaufmann DS. An extended Arctic proxy temperature database for the past 2,000 years. Sci Data 2014; 1(140026). Data available at http://ncdc.noaa.gov/paleo/study/16973 2017. (last access: April). Villalba R, Boninsegna JA, Masiokas M, et al. Large-Scale Temperature Changes Across the Southern Andes: 20th-Century Variations in the Context of the Past 400 Years. Climatic Change 2003; 59: 177-232. Data available at: ftp://ftp.ncdc.noaa.gov/pub/data/paleo/treering/ reconstructions/southamerica/patagonia-temperature.txt 2017. (last access: April). Stuiver M, Reimer PJ, Bard E, et al. INTCAL98 radiocarbon age calibration, 24,000-0 cal BP. Radiocarbon 1998; 40(3): 1041-83. Bard E, Raisbeck GM, Yiou F, Jouzel J. Solar modulation of cosmogenic nuclide production over the last millennium: comparison between 14C and 10Be records. Earth Planet Sci Lett 1997; 150: 453-62. Muscheler R, Beer J, Kubic PW, Synal H-A. Geomagnetic field intensity during the last 60,000 years based on 10Be and 36Cl from the Summit ice cores and 14C. Quat Sci Rev 2005; 24: 1849-60. Kantelhardt JW, Koscielny-Bunde E, Rego HH, Havlin S, Bunde A. Detecting long-range correlations with detrended fluctuation analysis. Physica A 2001; 295: 441-54. Lomb NR. Least-squares frequency analysis of unequally spaced data. Astrophys Space Sci 1967; 39(2): 447-62. Scargle JD. Studies in astronomical time series analysis. II - Statistical aspects of spectral analysis of unevenly spaced data. Astrophys J 1982; 263: 835-53.